Between 21 and 28 October 2016, nineteen Royal Navy CCF cadets (10 male and 9 female) and three staff members from Calday Grange Grammar School (Wirral, Merseyside) travelled to Gibraltar for an adventure training expedition. The expedition name comes from the MOD requirements that cadet expeds should include the word Venturer. 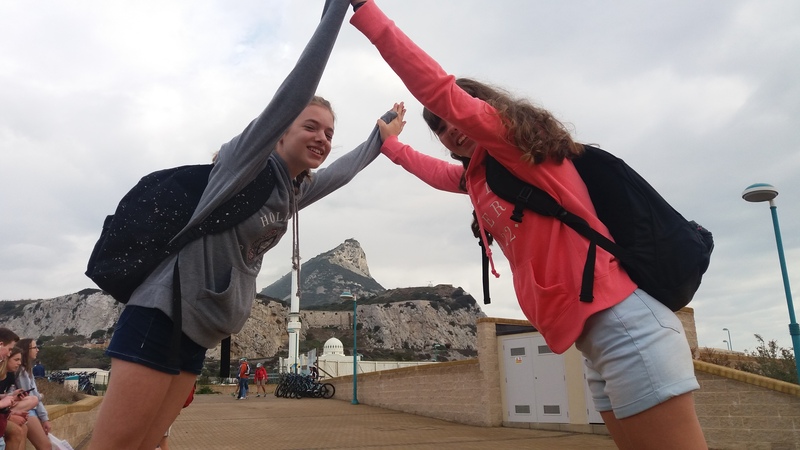 The original name for Gibraltar was Jebel-Tarik, or Tarik’s Mountain – this provided the perfect tag word to complete the title of our expedition. The watch-word which was the format of the event was decided upon very early in the planning process – this was quite simply self reliance. 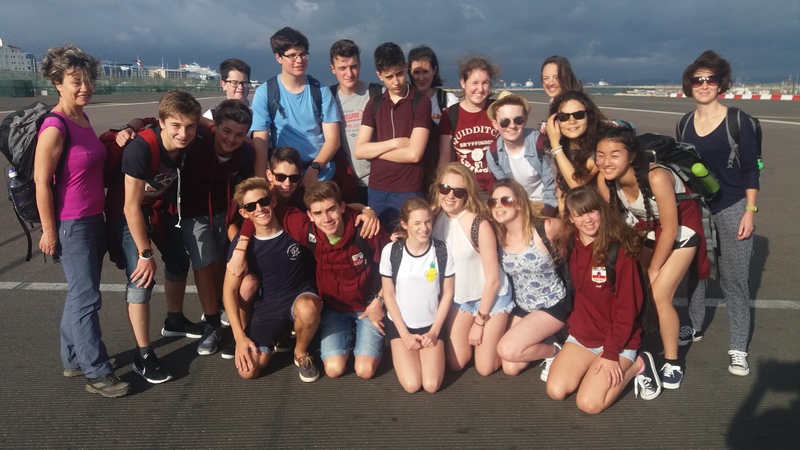 From the moment that the group left school on the coach en route to Manchester Airport, the cadets were in complete charge of their property, passports, cash and time-keeping. A number of the parents of the party members were a little askance at this plan! I was quite convinced that this was the way to proceed, though, and in the event it worked wonderfully. As belt and braces, I also held a full set of copies of everyone’s passport and EHIC card, just in case! The age group of the cadets was from 13 to 18. This is quite a large range of ages – at those ages, five years is a huge gap and the difference in maturity and personal development of some of the cadets was quite marked. However, there was no apparent disparity between the young people in regard of how they coped with the challenges and requirements of this trip. A number of them had not flown before and a larger number had never been away from their families for any length of time. Especially with the younger cadets, this was something which the staff was very attentive in watching out for any signs of home-sickness or other worries. In the event, there were no negative feelings that could be seen. I detailed a small number of the senior cadets to keep a careful watch for any signs of distress from the younger members – fortunately, this was never a problem. Rather the opposite was the case, as one of the younger girls texted her parents to say that she was having such fun and didn’t want to come home! After arriving at Manchester Airport, and proceeding as a group through the check-in and security stages, the members were then free to explore the shops and restaurants on offer in Terminal 2 (T2). Perhaps without realising it, this was the first chance they were given to have to plan and think for themselves – there are no voice announcements in T2 so they had to monitor the information screens and make their own way to the appropriate departure gate. Courtesy of a favourable tail-wind, the journey to Gibraltar was shorter than usual and after a flight of two and a half hours, we had the pleasure in walking across the tarmac at RAF Gibraltar (the civil airport uses the MOD facilities) in a most welcome 23 degrees – we had left Manchester in 7 degrees. As someone who has travelled the world extensively with my work, I am always very aware that the secret of foreign travel is to be unobtrusive. Gibraltar is a very safe place to visit, but with the reality in mind that there will always be people who might be tempted by situations, the cadets were instructed to always be in groups of at least four, but at the same time not to be in one huge group. This turned out to be a good plan and it worked very well. For very many years, there was an extensive military presence in Gibraltar. 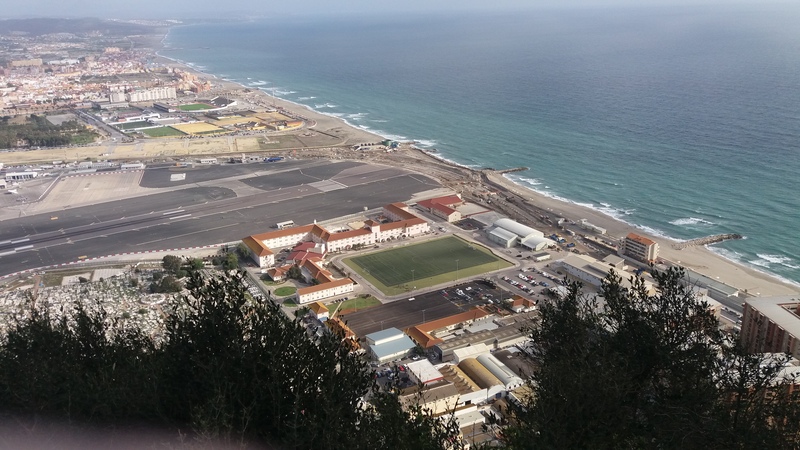 Because of its commanding position at the head of the Mediterranean and in its capacity as an important staging post for many military operations, especially in WWII, Gibraltar used to have a permanent large Royal Navy establishment, a number of British Army regiments and a bustling RAF presence. With the ending of the Cold War and the reduction in the general military establishment, Gibraltar has seen many changes to its links with the MOD. Nowadays, there are just occasional visits by warships, the RAF establishment is much reduced being mainly a transit service for supply flights and the army presence is now formed by the Royal Gibraltar Regiment (RGR). We are very fortunate in that the RGR are very keen to host visits by cadet groups and there is a well-run organisation which ensures that the planning and execution of such a visit is made very simple. We were accommodated in Devil’s Tower Camp (DTC), the main military base on the Rock. 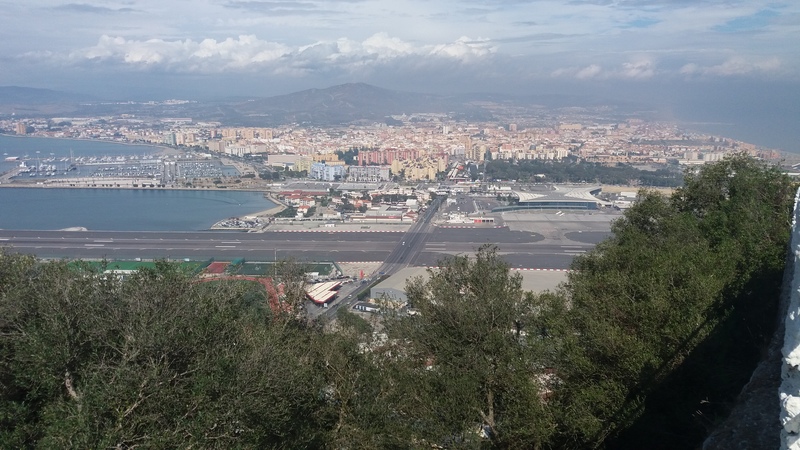 DTC is situated on the narrow isthmus linking Gibraltar with Spain, and has the most impressive North face of the Rock on one side and the airport runway on the other. Even after a whole week of watching aircraft taking off from only tens of yards away, the cadets still found it a fascinating sight to be able to watch this happen from a ringside seat. DTC has many visiting groups, both cadet and regular services, so the accommodation department has quite a job in allocating the rooms. They are very aware of Child Protection issues, and had accordingly put the whole party on its own on the third floor of Delta block. In advance of our arrival, the rooms had been labelled and suitable ‘no entry’ and ‘adults only’ signage had been organised and affixed. The female cadets were delighted with their room. It was a TINY space, obviously designed for about four people, but twelve bunks had been squeezed in and the girls had such fun in organising the room to their liking. It is still not completely clear how they managed to live in such a tiny space and to keep the room so immaculate. Conversely, four of the chaps had an ex-storeroom as their sleeping place. Even though their room had about the same square-footage as the ladies’ room, they never quite got the knack of keeping things tidy, and so we instituted a number of impromptu inspections to keep them on their toes – it didn’t really work, though. Next morning, after an early (0630) breakfast, we all got ready for the start of the activities programme. The historic and political status of Gibraltar were major parts of the study programme. Probably the best way to get, literally, an over-view of Gibraltar is to do what we all did first. 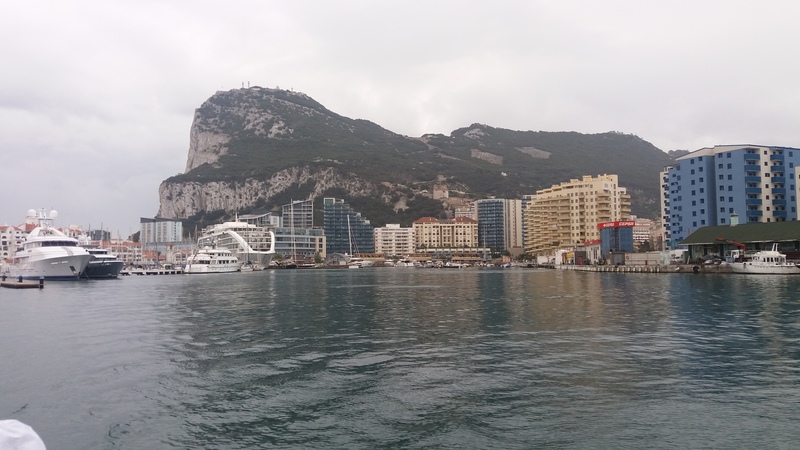 Fortunately, nowhere is very far away in Gib, so we walked into the town centre and took the wonderful cable-car to the very top of the Rock – a dizzying trip taking just three minutes. The spectacular view from the top shows just why Gibraltar has been such a vital place to be held by Great Britain since being ceded to the UK by the Treaty of Utrecht in 1713. To the North is Andalucia in Spain, with the Costa del Sol stretching away to the east in the misty distances of the Mediterranean. Turning to the South the coast of Africa, at its closest, is just nine miles away. The Atlas Mountains are spectacular from that distance and the cadets were awed at the view. 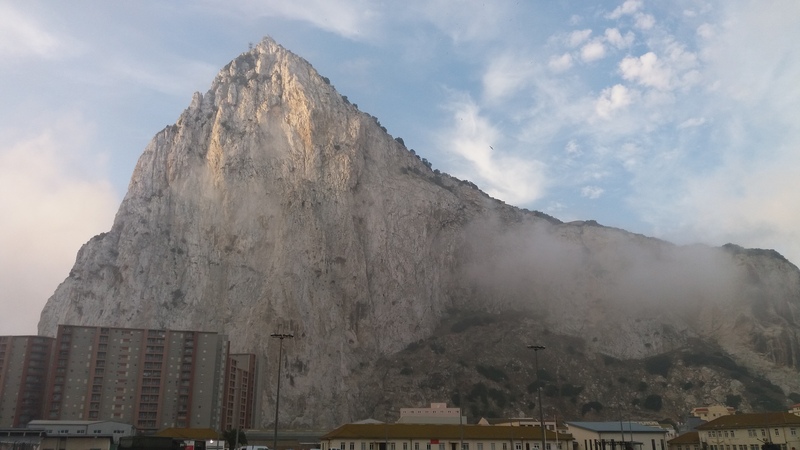 One thing that is very obvious to any visitor to the Rock is that there are many, many apartment blocks, most of which have sprung up over the last few decades. The available land area of Gibraltar is only around two square miles – in this tiny space, 30,000 people live and work. In addition, 8,000 workers cross the border every day from Spain to work in the town. 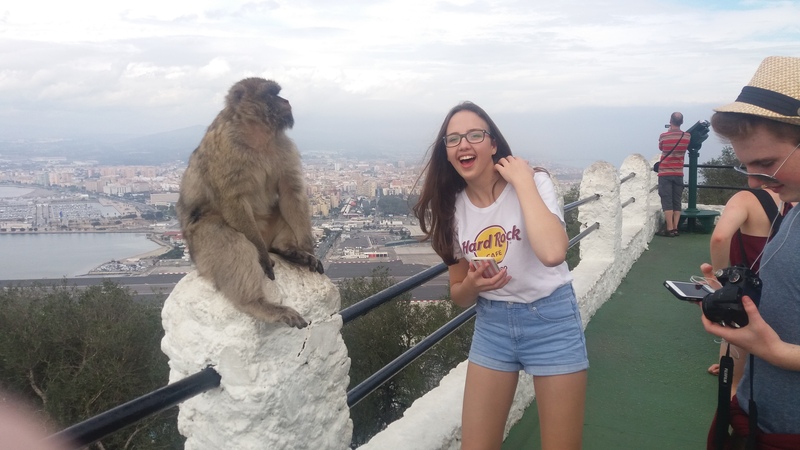 The top of the Rock was the first chance the cadets had to get to meet some of Gibraltar’s indigenous population, the famous Barbary Apes. The only such population in Europe, Gib’s monkeys are a signature feature of the place and the local government take great care of the health and nutrition of the monkeys. The main purpose of the trip were the watersports activities which were held at JPDU, the Joint Physical Development Unit at Gunwharf. This is a purpose-built centre available to the military establishment and offers the complete range of watersports. We had booked to include a number of different activites to be followed in a rotating programme. This included dinghy sailing, powerboating, paddle-boarding and water-skiing. Gib is a perfect place to do these activities as the combination of warm weather, safe waters and fantastic views make it so enjoyable. Each evening, there was a sports programme held at DTC. The gym department at DTC kindly lent a complete set of equipment for our use during the trip, so we took advantage of the floodlit Astroturf pitch. Each day was very long – a combination of early breakfast, lots of fresh air and multiple activities meant that there was no reluctance from anyone to have increasingly earlier bedtimes. We are all hugely grateful to the Ulysses Trust for such generous support for our trip. The grant has certainly eased the financial burden for the cadets’ families. Group photo in the middle of the active runway! Sophie and her new friend!